The concept of luxury erroneously tends to represent, according to the opinion of most people, something that hold great value and, thus, sometimes difficult for everyone to achieve. A 5-star hotel, a watch with a price tag in the thousands, or even a business class flight by airplane: the reaction to the cost of such services or objects leads to an idea of luxury. It is not a completely wrong perception, but a decidedly reductive one respect to what the adjective luxury can represent in every field in which it is used, from fashion to services, from cars to interior design. In fact, value in itself represents a consequence of what is attributable to luxury: a combination of valuable materials, design, tradition, style, finishes and decorations that lead to a surprising, elegant, and refined result. In interior design, specifically, this value is expressed through the variety of “means” mentioned above, in environments that stand out for their aesthetics and functionality. An example of this is luxury Italian furniture by Arredoclassic: a design in which elegance, quality and Made in Italy work in synergy and in which each element has its own purpose. 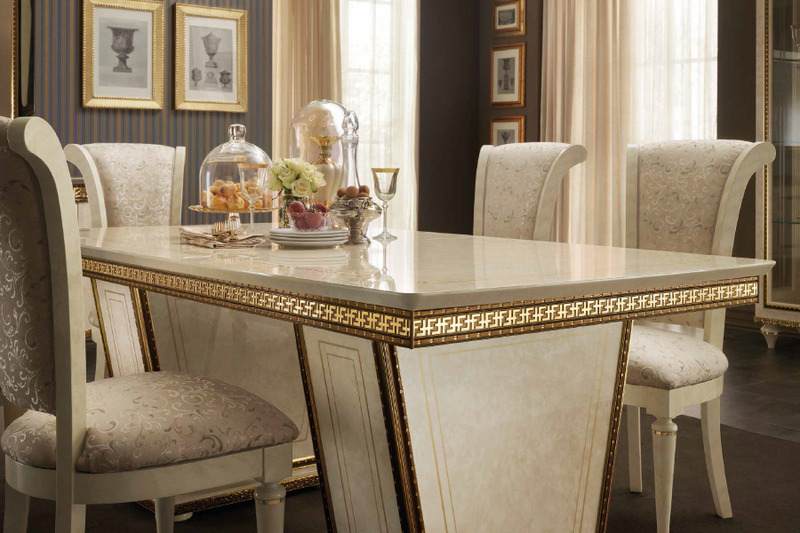 Elegance and quality represent luxury in its purest essence, and to this it is possible to add value with sumptuous and even pompous elements, without overdoing and “falling” in an excessively baroque style. 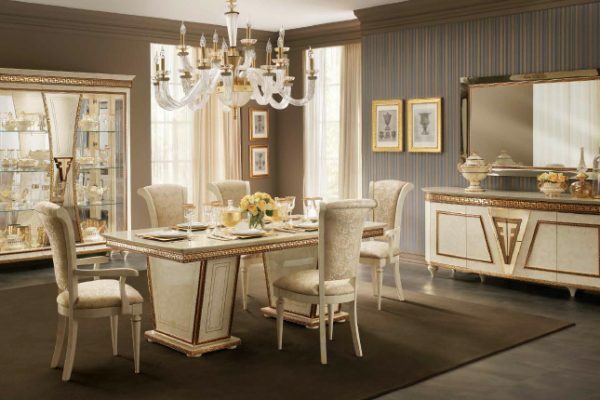 Furnishing an environment with luxury Italian furniture means choosing to pursue balance and harmony, with furnishings made with skills and refined materials, including decorations that may amaze for its exclusivity. Leaving for a moment the predominantly aesthetic idea associated to the perception of luxury, we can see how said concept currently also applies to an idea of well-being and comfort, in which design solutions focusing on the person are sought. This too can be defined as luxury, even more so nowadays, where technology radically changes everyone’s life and highlights more clearly this relationship with well-being. Therefore, living in a luxury environment means satisfying not only the visual sense, but also what in our brain leads to a feeling of pleasure related to living: a goal on which Arredoclassic’s designers focus with to create high quality luxury Italian furniture solutions. Solutions that give exclusive personality to your interiors, creating and introducing elements of value to meet your aesthetic and functional needs and thus also your need for physical and mental well-being: exactly the feelings that everyone would love to experience when finally heading back home after a hard work day or during a rainy weekend. It is even easier to understand from this perspective that luxury in this sense is not conceptually linked to high value, but also and above all to an emotional factor capable of providing psycho-physical rewards. And the designer adapts to this vision by seeking this result in lines, space, materials, colors and lighting. Like a dress that perfectly fits from each and every point of view. Luxury (without distinction of sector) is the only market in the world that was not affected by the economic crisis, on the contrary, it is growing and is performing well despite the global financial situation. Beyond the global situation, the search for an exclusive product (or service) (by brand, design, quality, etc.) can change depending on the country of origin: for this reason we believe it is fair to say that the adjective luxury can take on different nuances according to aesthetic culture and traditions of different countries in the world. True luxury Italian furniture in particular, together with other features, can rely on a strong value indeed: that of the Made in Italy. As for cuisine and fashion, Italian design is very successful abroad (in certain countries or areas more than others) and is able to stand out clearly for quality and manufacture. For those who buy, Made in Italy is a sort of quality certification that makes the products of our country unique and sometimes unrepeatable. Tradition and attention to detail that Arredoclassic does not give up and that are at the basis of the success of the brand in the global luxury Italian furniture market. about our products and where to buy them? The Pesaro brand makes strategic use of Made in Italy and considers it essential to ensure that the various collections in elegant classic style reflect said high quality. For this reason, Arredoclassic has decided to certify its commitment through the Institute for the Protection of Italian Products and to join the IT01 System, thus ensuring clients excellent standards in terms of quality and traceability. In fact, the “100% Made in Italy” certification is issued by the institute only to companies that are deemed worthy of such title after a strict process of inspections aimed at demonstrating the complete Italian nature of the production cycle. Obtaining the related certification means ensuring the originality and quality of the design proposals by Arredoclassic also in terms of corporate image, highlighting the creative effort so much appreciated outside our borders. The Marche region, and specifically the heart of the Pesaro-Urbino province, is where Arredoclassic set up its production chain, from the research and design stage to the specific finishes and processes: every single step in creating the brand’s elegant luxury Italian furniture takes place in the district of Pesaro. Based on the tradition of classic and its refined aesthetics, the manufacturing of luxury Italian furniture begins in the heart of the company technical department, where designers use their creativity to create valuable solutions for your home environments. Following the manufacture of individual furniture, the cycle ends in the skillful hands of artisans who bestow the most elegant look to the furniture by applying traditional techniques such as gold leaf, lacquering or the processing of fabrics and upholstery. Gold leaf: a gilding with a centuries-old, or rather ancient, tradition, in which timeless beauty and the aesthetic strength of Made in Italy, stand out. This artisan work involves the application of a very thin layer of gold on the chosen surface (which must be perfectly polished and covered with glue in a precise manner), on which a protection layer must be added to preserve the brilliance over time. The Donatello collection is a sublime example in this regard. Lacquering: this finishing technique helps brighten the individual elements of the Arredoclassic collections and to implement that precious touch that luxury furniture unequivocally have. Technological innovation made it possible to make this artisan work more stable and lasting, as it is evident in the Liberty, Leonardo and Melodia collections. Fabrics and upholsteries: another manufacturing process that is carefully treated in an artisan way and that relies on an upholstery department, capable of customizing in a unique and creative way the request for luxury solutions through precious fabrics and textiles. The upholstered seats are designed with a balance between shape and volume with an extremely elegant result, while damasks, chenilles and other filaments can characterize the furniture in a refined way. Furnishing from scratch or redesigning the interiors of a home, seeking a look that is elegant and luxurious opens up a multifaceted universe in which various factors and distinctive elements play their part to achieve that “high-ranking” idea. It means, therefore, as we have already described, opting for certain styles that are suitable for luxury (such as classic or traditional), elegant and decisive linearity, fine materials and refined finishes, precious but essential decorations. It is therefore recommended to use high quality marble and wood, gold and stucco, unique and exclusive pieces, ancient Persian carpets, able to welcome you with warmth inside the home walls and to satisfy at the same time your visual need for beauty. Not to mention the importance of colors and lighting in the design of a luxury environment, which should aim at highlighting the context, and not themselves, standing out as elements unrelated to the environment. Arredoclassic adds its Italian creativity and attention to detail that make it possible to perceive the passion that everyone in the company puts in its work, whether intellectual or manufacturing, in the search for an exclusive result through the rules of the classical style. 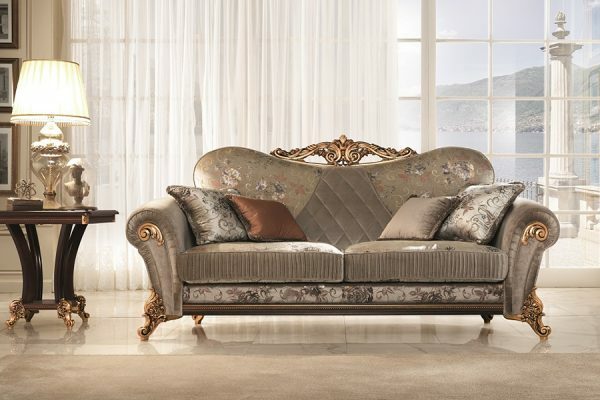 Classic rules with style and Arredoclassic creates its own collections of luxury Italian furniture: a redesign of the stylistic elements born in ancient Greece that through the centuries – from imperial Rome all the way to the Renaissance – renewed themselves every time remaining current, even nowadays. Classic style furniture is a real evergreen of interior design, provided as it is of literally immortal aesthetics that allowed it to “travel through time” without losing that ancient and refined character that distinguishes them. A style based on the search for harmony, balance and proportion, in which the idea of luxury emerges as a consequence inherent in the classic itself. With its collections, Arredoclassic takes up the ability of the stylistic elements, born in the ancient cultural cradle of Europe, to always leave a mark, or rather an aesthetic and emotional impact that can remain unmistakable and to recall at the same time the Italian furniture tradition. 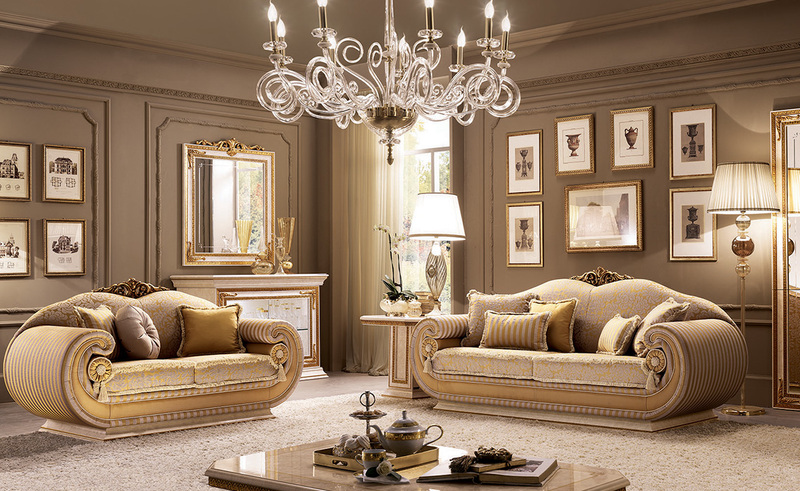 In every home environment the uniqueness of classic Italian style can stand out offering with their harmony of lines, shapes, colors and precious details a luxurious atmosphere that reminds that of the ancient villas of the patricians or the elegant palaces of the Renaissance. Places where elegance, refinement and familiarity coexist in an extremely friendly and social way. The interiors of a house express personal taste and passion, the environment must be recognizable and familiar to those who experience it. For those who seek to experience luxury that is elegant and sophisticated, it is fundamental to look for an unmistakable and exclusive style that can support this need. 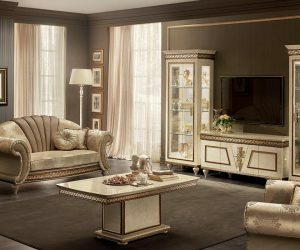 The luxury Italian furniture designed by Arredoclassic exploits the wealth and purity of classic style to achieve this effect, offering to this end a wide variety of collections that are well diversified and that at the same time provide a reasonable chance to combine individual elements. A room dedicated to rest and relaxation, where one spends the most intimate moments of the day in search for mental and physical renewal. The bedroom plays this role in a significant manner and it does not require opulent or excessive solutions. Luxury can be achieved through refined and streamlined design solutions, capable of providing a strong yet relaxing personality. The line and decorations recall each other between bed and wardrobe, bedside tables and dressing table in a sort of harmonious ballet. The living room is one of the most lived-in rooms, together with the family room (with which it can be compared): it is the place for special moments, dinners with friends, and tea in company. This public perspective requires a certain attention in the design that attracts and satisfies tastes different from the ones of the homeowner. Table and chairs form almost a sole body in terms of lines and shapes, while golden decorative motifs insistently recall the precious display cases that frame the convivial area, supporting the conversation with elegance and refinement. The pleasure of luxury is a direct consequence. Halfway between conviviality and the search for relaxation, the family room is also a place dedicated to public life and needs careful design that can be welcoming and showing off its beauty. Often it is the most cared for and important room and so it must be also in terms of design. Sofas and armchairs, poufs and tables, TV and related furniture: each piece of furniture is inserted with balance to convey in a clear and definite manner a sense of exclusivity.